The Preakness Stakes is run annually at Pimlico Race Course in Baltimore, MD and is considered an American "classic" as the second jewel of the famed Triple Crown series. The grade 1 race was inaugurated in 1873 and is run at a distance of a mile and three-sixteenths. Offered for a purse of $1.5 million in 2017, the Preakness is always run the third Saturday in May and regularly features the best of the three-year-old crop including the Kentucky Derby winner. 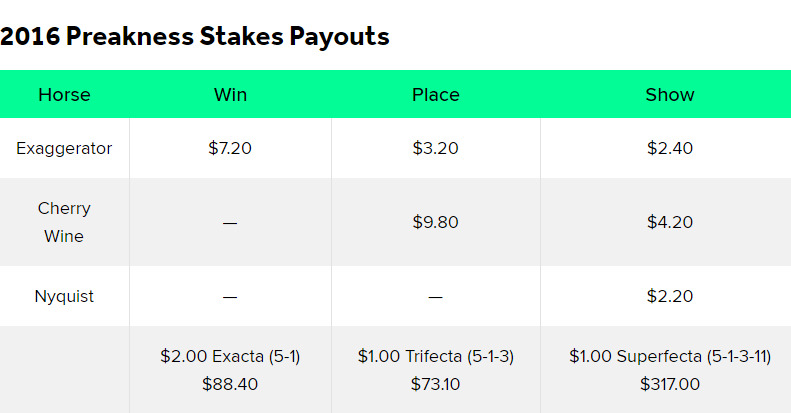 Regardless of how players bet the Preakness, selecting the right online racebook is critical. First, the ease and convenience of wagering from a laptop or mobile device provides a huge advantage for players looking to enjoy the action from home or on the go. Secondly, the financial incentives offered by the racebooks below include generous rebate, loyalty and bonus programs that make profitability a little bit easier to achieve. The Preakness is easily the biggest race held at Pimlico each year, drawing the largest on-track attendance and attracting a national television audience. The race features large betting pools and comprises the final leg of a lucrative Pick 4 and Pick 6 wager in addition to generous exotic handle in the exacta, trifecta and superfecta wagers. The race is one of the best betting opportunities of the year and gives horse players and casual fans alike an exciting challenge. Since the idea of the Triple Crown was conceived back in 1930, horse racing enthusiasts have passionately followed the Kentucky Derby, Preakness and Belmont Stakes. Considering that just 12 runners in the history of American racing have swept the three events, perhaps the desire to see a horse do something truly special is the allure. In any event, the Preakness is a world-class race that continues to capture the hearts and imaginations of American racing fans. The added opportunity to make some serious cash certainly adds to the appeal. While the Preakness certainly doesn't draw 20 horses each year like the Kentucky Derby, the race almost always attracts the Kentucky Derby winner and a few of the most serious contenders as well as some new shooters. Because the Derby participants are racing again on short rest (just two weeks), the Preakness presents a unique challenge for those runners. Still, horses that have run in the Derby have fared much better in the Preakness than those who skipped the race. Since 2000, just a single Preakness winner did not race in the Derby, the incomparable filly Rachel Alexandra in 2009. While the Pimlico dirt tends to favor early speed, the Preakness has tended to play equally fair to speed horses and closers. The 2016 Preakness featured the undefeated KD winner Nyquist against familiar rival and Derby runner-up Exaggerator. Despite having defeated Exaggerator in their previous four meetings, Nyquist found himself leg-weary in the stretch after setting very fast fractions over a sloppy racecourse. Exaggerator once again showed his fondness for an off track, splashing home three and half lengths in front of the tiring Nyquist who was nosed for second by longshot Cherry Wine. The victory marked Exaggerator's third stakes win in as many tries on a wet track. The colt would go on to make that record 4 for 4 on July 31 by winning the Grade 1 Haskell Stakes at Monmouth on a sloppy track, again defeating Nyquist. Both colts were retired to stud following the 2015 racing season. Nyquist, like fellow recent Kentucky Derby winners Mine that Bird (2009), Super Saver (2010) and Orb (2013), never won another race after winning the Run for the Roses. The infield on Preakness day is renowned for being a racous party scene, leading to popular catch phrases such as "Freakness" and "Get Your Preak On". The Preakness was first run in 1873 - two years before the first Kentucky Derby. 23 horses have won the Kentucky Derby and Preakness Stakes, but just 12 have gone on to win the Triple Crown. The name Preakness comes from a Native American word that meant "quail wood". 135,000 people attended the Preakness in 2016. 98 Preakness winners have been bred in Kentucky.